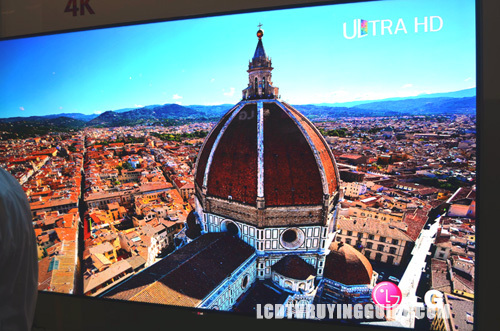 The LG 49UB8500 is the value option for 4K LG LED TVs this year. These TVs keep all the feature necessary for a 4K TV like HEVC video processing, the IPS panel, and the 120Hz refresh rate while dumping extras like powerful built-in speakers and the futuristic looking stand. The new WebOS smart TV interface and excellent passive 3D performance really make this one a complete package that will impress for years to come. The UB8500 keeps the price down to a reasonable $1,499 for the 49 inch size. The Tru-Ultra HD Engine is in charge of up-scaling duties on the 49UB8500. Since the selection of 4K content is still sparse (but we are getting closer), the up-conversion quality of 1080p and 720p content is very important. LG hasn't created a content distribution system like Sony has, so it is even more important for this to be excellent. The UB8500 uses a 4 step process to examine and enhance broadcasts, recorded video, and home video game consoles. The result is a sharp and clear picture on a 4K screen with the IPS panel providing much improved notable side viewing angles. The included HVEC is another plus for efficient streaming for the best picture possible. Black levels, while not the best in the industry are nicely saturated to help contrast level and color pop. We did note some blooming/light shading near the corners of the picture when there was either very dark or extremely bright image displaying on the screen. This is somewhat to be expected from an edge lit LED/LCD. Yet again we recommend turning this feature off for all but live sports programming due to the kitschy soap opera appearance it causes by reducing natural background blur. Each input selection will have this feature on as the default setting so you'll need to disable for each individually. The IPS panel is something else to be excited about and not just a fluff spec. We've seen IPS (in-plane-switching) panels in Panasonic LED TVs before, and the improvements are excellent. Side viewing angles are improved as well as light flow-though and an overall more brilliant image. Color reproduction benefits as well. Colors come out looking much brighter if not a bit more unnatural. Side-angle viewing improvement is the main trait we look for in an IPS panel and the UB8500 delivers there. If you are a 3D aficionado then this 4K passive 3D TV should be an excellent contender for you. The 4K resolution makes a huge quality improvement difference. However, there is cross talk visible from certain angles and it's annoying. When viewing 3D content make sure to side with your eyes on the same height level as the middle of the screen. This helps a lot and you can find an angle at which there is no visible cross talk. If your eyes are above the screen you will likely see the cross talk. We thought LG's Passive 3D was some of the best performing 3D out there last year. In fact we now prefer it over active 3D for a great consistent picture with much less flickering. The best part is that the glasses are cheap, comfortable, and light. 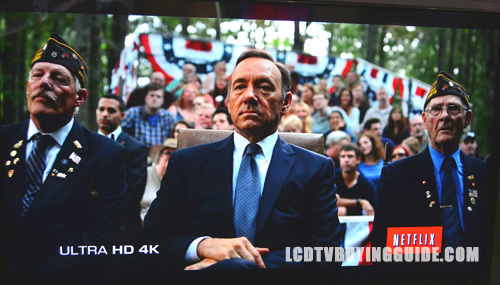 But with Blu-Ray 3D content the TV displayed a great amount of depth, rich colors, and good contrast. Brightness is where the UB8500 looses some points when it comes to 3D content. The overall image seems a little dim and lacks the brilliance seen in 2D content. Side angle viewing is saved by the IPS panel. We see some loss of contrast as you move off-center, but color degradation is minimal. 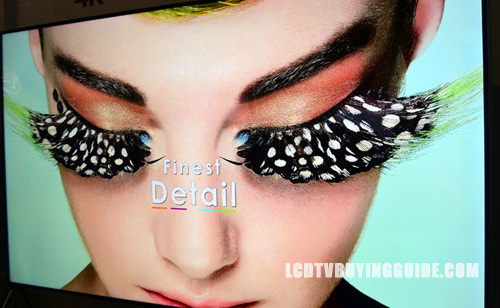 The built-in HEVC decoder on this LG ULTRA HD television makes it ready to display 4K content. LG has really switched things up this year when it comes to their Smart TV platform. 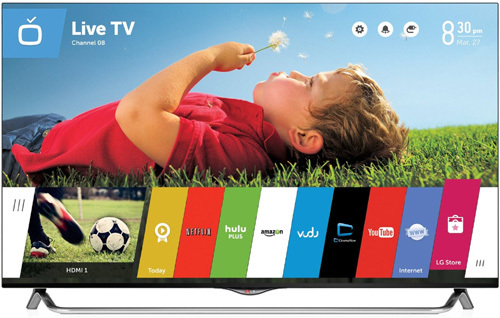 Needed improvement in Smart TV functionality has arrived with the new 2014 LG TVs. The new WebOS operating system for Smart TV function is very fast in load time and selection. The design and layout is simple and much more straight forward than in the past. And, it's highly customizable and easy to organize in a fashion that best suits your content selection needs. The ability to rearrange the content tabs at the bottom of the screen is unusual and very convenient. Simple is the name of the game here. Instead of a home screen with tons of buttons, you get a nice colored strip across the bottom of the screen populated with your favorite apps and the LG store. What you are currently viewing stays on the screen. Click the left arrow on the screen to see your open apps and the right arrow to show all the app downloaded to your TV. We were impressed with the speed of switching between apps. It was instantaneous. Last year a big complaint of ours was the poor streaming ability of LG's Smart TV platform as well as slow load times. That's not the case this year thanks to the complete overhaul of the entire platform. This means the buffering times of streaming 2D and 3D content are greatly reduced. Overall, the move to a WebOS based system was a good move on LG's part. Well worth the investment. Finger Gesture is a new feature using the optional camera. It is limited in use and operation to just a few functions. A small arched menu appears on the screen when you access it with your finger. You can control volume, On/Off function, or input selection but that's it. It's primary practical function is volume adjustment without the remote for all practical purposes. LG hopes to add more functionality to it later. It works reasonably well, but again, you probably won't use it much. The new Magic Wand Remote included with the UB8500 has seen a number of improvement since last year. In our reviews last year, we thought the magic remote was a handy inclusion and far superior to other remotes on the market. This one is even better – with fast point and click browsing capability that really helps navigation in the menus as well. We are happy to welcome it again with new voice features and an input button that was lacking last year. We have also found through some thorough testing of all manufacturers remotes that the point and click features on the LG Magic Wand are the fastest way to browse the Internet, so if you plan on doing a lot of Internet search with your remote this does make a big difference. Sound Mode Options Choices – Solid Sound Quality! Clear Voice II and Virtual Surround Plus options here add interesting choices, but our choice is the Cinema setting with Clear Voice II setting enabled with the level set at 3. The Standard setting is our second favorite with Clear voice II enabled. Overall we rate the sound quality of this TV as excellent for a super thin depth TV and a high point. It is better than the other manufacturers (again, just for super thin depth) we've tested as well by a long shot. The speaker in the bottom back of the TV adds most of the overall depth to the TV but we believe it is well worth it to have good sound from the TV. These minimalist TV designs are often used in spaces without home theater systems. The 49UB8500 adopts the wide stand design that we have seen so much of over the past year. It is a sleek and minimalistic look, but but make sure your TV stand will accommodate the width. Wall mounting this super thin depth TV will obviously look great. The Cinema Screen design provides very thin black bezels and a super slim profile. Since the 49UB8500 primary objective is to provide an excellent entry level price for 4K TV, the price is very competitively prices at $1999 by most retailers. The UB8500 series sheds the massive sizes and powerful speaker systems to achieve that goal while keeping picture quality a priority. At $1,999 it is priced competitively with similar models from Samsung and Sony. The Samsung UN50H8550 also offers strong picture quality and a robust Smart TV platform for about $300 more. Sony's entry level 4K TV the XBR-49X850B is a good comparison at $2000. TV without stand (WxHxD): 43" x 25.4" x 2.1"
TV with stand: 43" x 27.1" x 9.5"